Just a quick update post on the eruption of Popocatéptel in Mexico. The alert level has remained at Yellow Phase 3 although activity has subdued. Below is an image of the latest webcam taken from the CENAPRED website. We can still see clear steam emissions, although current ash content looks low. This is confirmed in the latest report on the eruption which states that in the 7 hours leading up to the report the eruption bursts were small with seven occuring during that time. An image of the largest of these bursts (at 800 metres high) is available here. There are also some photos of the eruption on the BBC website. Popocatépetl is currently in the process of a light erutpion and as a result its alert status has been raised to Yellow Stage 3, which is the third highest alert status. The image below from one of the webcams is at 12:15pm GMT, with the plume just being caught by the sun you can see that the plume seems quite white in nature, which indicates that there is a large amount of steam in the plume itself. Popocatépetl is North Americas second highest volcano at over 5400m and derives its name from the Aztec language, which means 'Smoking Mountain'. In general, eruptions from Popocatépetl are fairly regular with around 10 eruptive episodes (which can span for many years) over the past 100 years. 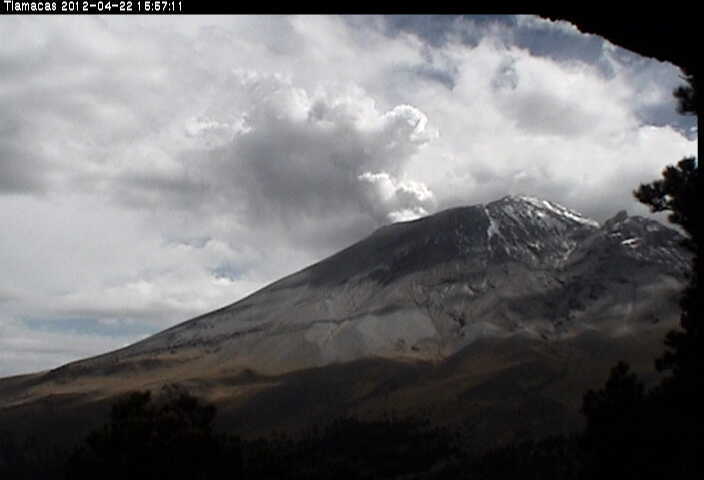 Erik at eruptions has also posted on this upgrade of alert status and gives a useful summary of the situation so far and a little bit about eruptions at Popocatépetl. Latest reports for the eruption can be found here. El Chichón, the eruption of 1982. El Chichón volcano is located within the Chiapas region of South-East México at an elevation of ~1150 m (GVP, 2007). It is a remote andesitic stratovolcano in the Modern Chiapanecan Volcanic Arc (MCVA) with an ago of ~0.2 Ma years. El Chichón is at the most North-Western extent of the MCVA which is thought to be ~3 Ma years old (Manea and Manea, 2008; Simkin and Siebert, 1994). The closest volcano, Vulcan de San Martin, is 200 km to the North-West. El Chichón has been sporadically active during the recent Holocene period and in the geological record there are a minimum of 12 eruptions detected during the past ~8000 years; none of which are thought to have been larger than the 1982 eruption (Tilling et al. 1984; Macias et al. 2008). Historically the eruptions seen at El Chichón are a combination of lava dome and phreatomagmatic eruptions; the main hazards from eruptions are ashfall and column collapse causing PDCs (Pyroclastic Density Currents) (Tilling et al. 1984; GVP, 2007; Macias et al. 2008). The eruption which occurred ~600 years ago is thought to have played a part in the downfall of the Mayan civilisation! The modern day eruption started suddenly on the 28th March 1982 at 23:22 local time with a plinian eruption column reaching to ~20 km (Sigurdsson et al. 1984; GVP, 2007). A max column height of ~27 km was recorded (Macias et al. 2008). This first major episode lasted until 0600 on the following morning and the population within 5 km of the volcano began to evacuate due to the high amount of ash falling as far as ~20 km away. During the following days there were a few minor phreatic eruptions recorded on the 30th and 31stof March (Sigurdsson et al. 1984; GVP, 2007).